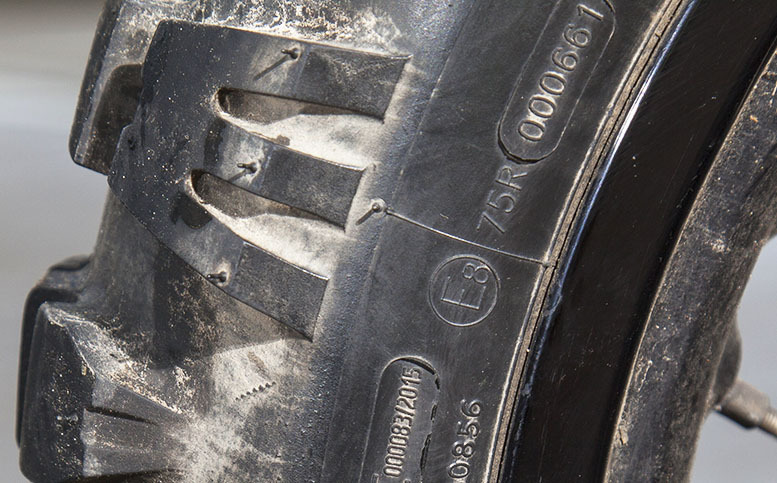 The first number in the size code (150 in our picture) is the tyre’s width, expressed in millimetres, from one sidewall to the other. This is measured with the tyre in its natural state (it might change once it’s been fitted to the wheel rim). The next number is the tyre’s aspect ratio, which is essentially its height expressed as a percentage of the tyre’s width. In our photo example the height is 105mm (70% of the 150mm width). 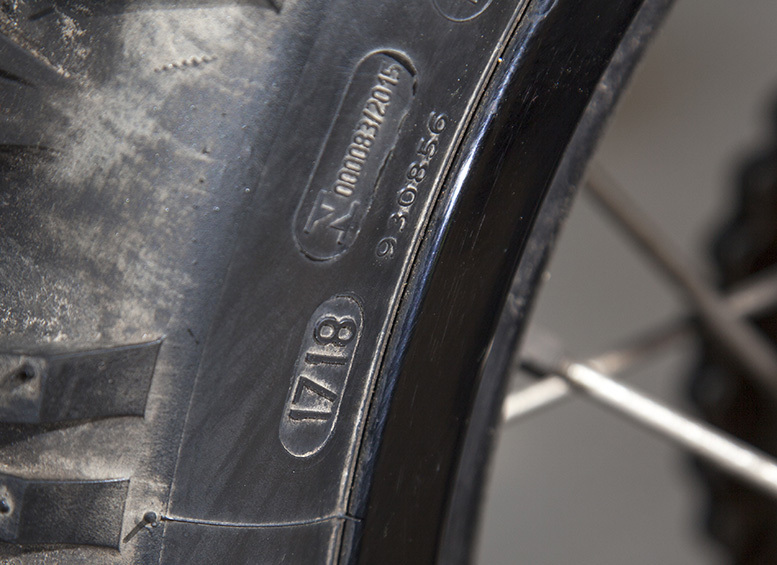 The last number is the diameter of the wheel rim the tyre is designed to fit − in this case it’s meant for a 18-inch rim. There are two parts to this section (it’s ’75R’ in our picture. 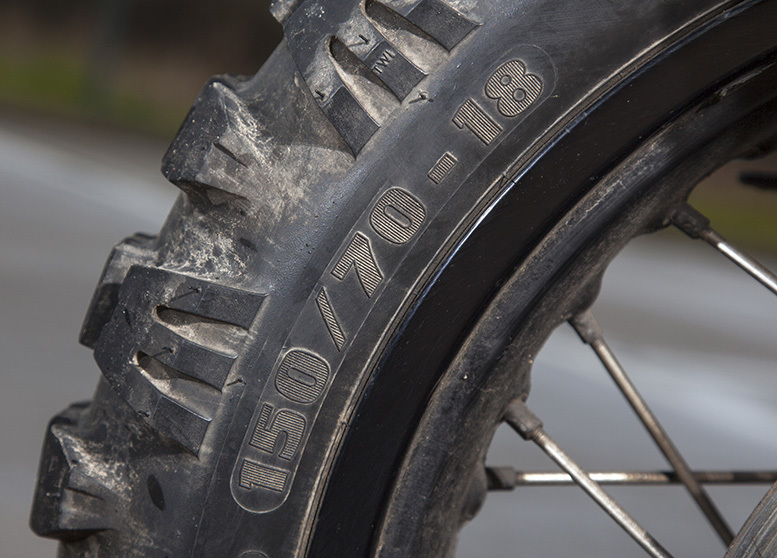 The number relates to the maximum loaded motorcycle weight the tyre is designed to carry. Our table (below) translates this number to the actual maximum weight in kilograms. The letter at the end shows the maximum speed the tyre is designed to run at while correctly inflated. 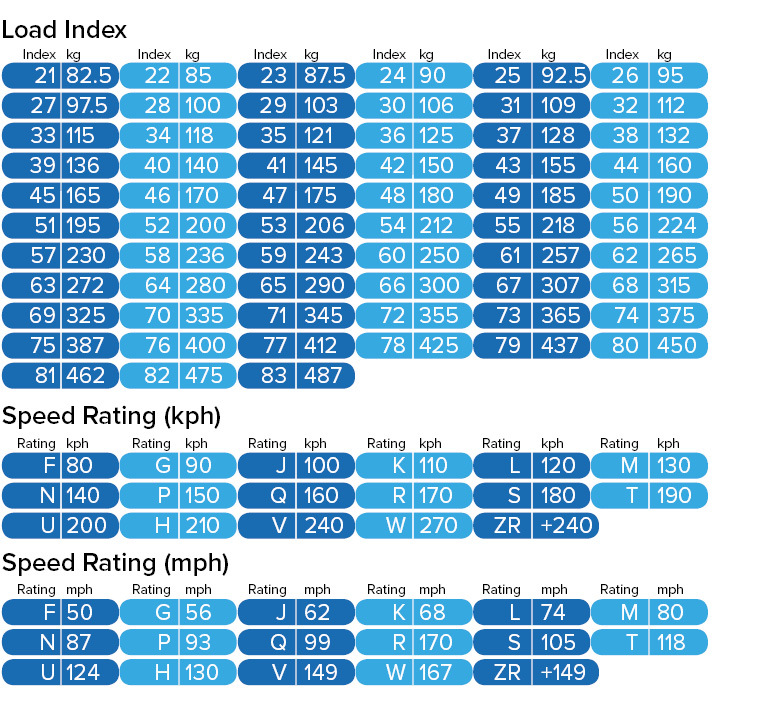 Again there’s a table to show how each letter relates to a speed, in kilometres per hour or mph. If this isn’t pointing in the direction the tyre will be travelling, call your tyre fitter. It’s an MOT fail here in the UK if the tyre isn’t rolling in the specified direction. 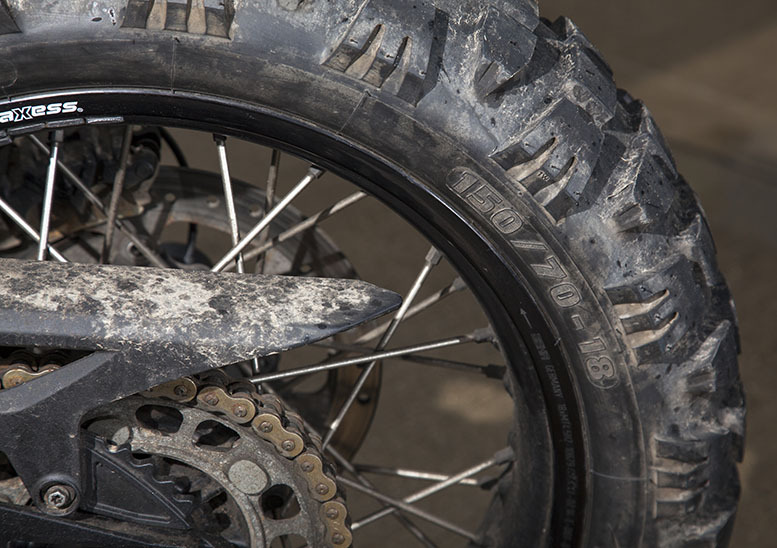 A wrongly-mounted tyre can overheat and start falling to bits, which is worth avoiding. Wonder how old your tyre is? This will tell you. The second two of the four digits show the year of manufacture and the first two show the week within that year. So this tyre was manufactured in the 17th week of 2018. Shows it’s been approved by the United States Department for Transport for use on their roads. 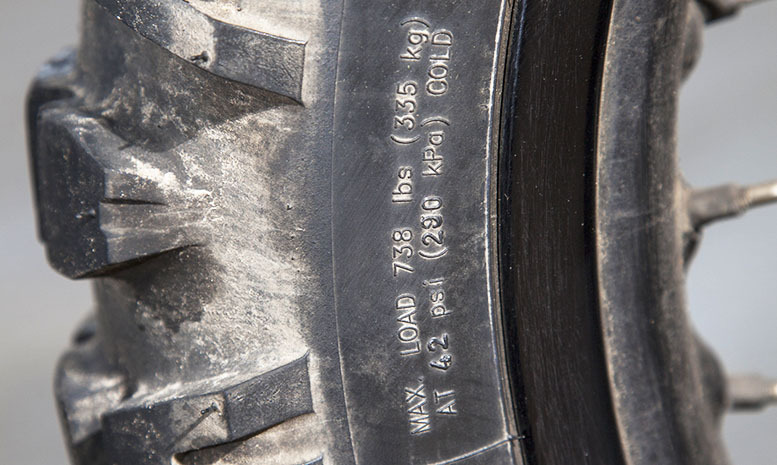 The following code is the tyre ID for the States. 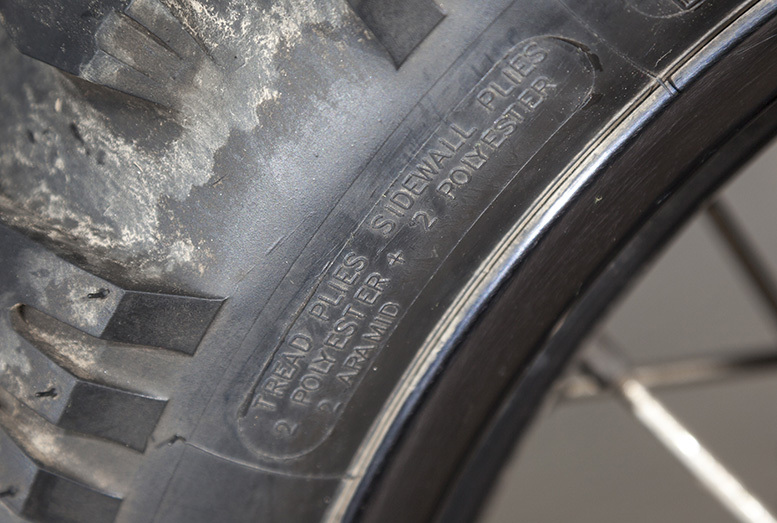 This denotes whether the tyre is designed to be used with or without an inner tube. This is alternatively displayed by the codes TL (tubeless) or TT (tubed type). 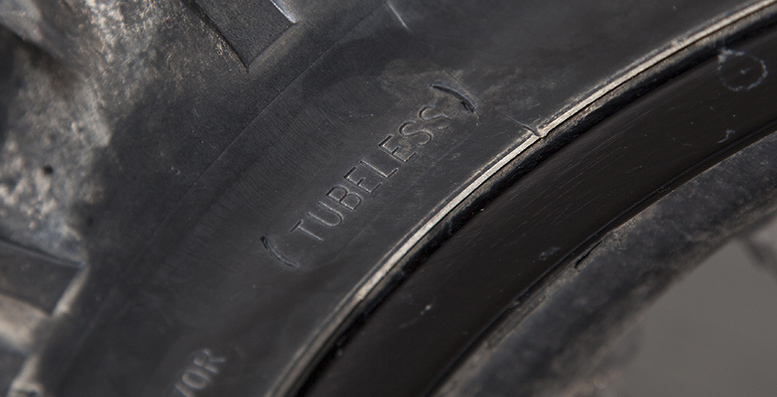 Tyres designed to run with tubes can’t be run on rims designed for tubeless tyres. Tubeless tyres can run with tubes in them, and do so as standard on several modern bikes, usually ones with lace-spoked wheels. Beware, though, as using tubes can reduce the maximum rated speed. As an example, Continental reduces the speed rating of its ZR-rated radials (from 240kph/149mph+) to H-rated (210kph/130mph) if they’re fitted with tubes. This info is an extended form of the info in the Load Index (above), showing the maximum load in kg and the inflation pressure required to carry that weight. This info is displayed for the United States market and isn’t necessarily shown on tyres for sale in Europe. This info shows what materials the tyre is made from. This info doesn’t need to be shown on tyres for sale in Europe. America does demand it, so this tyre’s manufacturer (Mitas) display it to cover all markets with one tyre.